Essentially he uses empirical evidence to draw the conclusion that most recent climate variability is due to Pacific Decadal Oscillation, and to Cosmic Ray effect as described by Svensmark. This fits with what William Kinninmonth explained and I described as essentially a massive pool of “stored cold” in the abyssal depths of the oceans, which erratically reaches up and pulls in heat from the insubstantial atmosphere above. Air temperatures are at the beck and call of the releases of this “cold” (yes I know cold is just an absence of heat). In El Nino years when the cold pool lies deep and unstirred, the incoming solar heat builds up on the surface. With the oceans covering 70% of the planet and the clouds covering over 60% of the sky, water in its various forms, dominates our climate. Solar magnetic effects correlate with changes in clouds. This graph below shows the rise and fall over the last 1000 years. Both the Medieval Warm Period and the The Little Ice Age (upper graph) match the highs and lows of Galactic Cosmic rays (lower graph). Cloud cover has reduced by 4% since 1984. This would account for a significant part of the warming since then. Less incoming sunlight gets blocked and reflected out to space. One of the most interesting slides is this one of outgoing long wave radiation (OLR). This has risen over the last 62 years, and by a large amount. As the planet warms we’d expect more OLR, but if feedbacks are positive, we wouldn’t expect the increase to be this large. Van Andel suggests the rise is “equivalent” to reducing CO2 from 800ppm to 280ppm — in other words, whatever warming effect CO2 might have is being swamped by larger factors. According to the models humidity ought to rise as the world warms, providing the major bulk of the positive feedback in the IPCC climate models. And it does — but only in the lower atmosphere. The rising humidity would have the largest warming effect if it occurred higher in the troposphere (thereby creating the hot spot), but specific humidity at up at 600mB has been falling, not rising — and the fall is even larger at 400mB (lower pressure means higher in the atmosphere). Noor van Andel points out that the 800 year lag (driven by overturning oceans) and that the ice cores show no evidence of positive feedback as the world warmed from the last ice age. Van Andel does something that few have done — he sums up Miskolczi’s theory (as mentioned by David Stockwell). The slide presentation has many strong graphs on Miskolczi’s theory. Trenberth: Window radiation = 40 W/m^2. Satellite measurement: 66 W/m^2. Prof.Trenberth wrote us that he knows this. But he kept his 40 W/m^2 disregarding measurements. An atmosphere where specific humidity increases everywhere with temperature has a large climate sensitivity. It has a tipping point. Trenberth: Relative humidity is constant everywhere. Satellite measurement: Humidity is decreasing. Prof.Trenberth wrote me that he thinks it is increasing and advises me to read the IPCC reports. Miskolczi: Window radiation is exp[-1.868] or about 1/6 of surface upward IR; Clouds keep τclear at 1.868; more CO2 is compensated with less water vapor. The greenhouse effect is not a free variable. It is controlled by maximum entropy production. Surface temperature is only a function of absorbed solar radiation. I challenge everybody to falsify Ferenc’s hypothesis with measurements! The right physics in my opinion: We have a strongly controlled climate. The solar constant and the physical properties of water keep us controlled. The heat transfer from surface into space uses two mechanisms in series: Convection in the lower atmosphere, IR radiation in the higher atmosphere. More convection means a higher tropopause, a lower cloud top temperature, a higher condensation efficiency, and in this way a drier upper troposphere. These two effects: a higher convection top and a drier upper troposphere, both increase Outgoing Longwave Radiation. This controls the temperature. It is shown that the cooling of the tropics, or trade wind belt, is by deep convection, i.e. by a few thousand concentrated tropical thunderstorms that carry all the sensible and latent heat swept up by the trade winds all the way on to the tropopause. The trends of the temperature in the high atmosphere in the last half century are very negative, starting on this height where the convection reaches. That means that more CO2 has a cooling effect rather than a warming effect. Cloud tops radiate much more intense than the thin air on this height. This is the cause behind the cooling, as much as the CO2 increase. theory, but is quite in accord with increasing deep convection. The adjustment of these temperature measurements to bring them more in line with the climate models leads to unphysical conditions and processes. Rising Outgoing Long-wave radiation with more than 3.7 W/m^2 per ºC SST cannot be the effect of rising CO2 or of the increase of other “greenhouse” gases. Rising OLR/SST with 8.6 W/m^2K means that the atmosphere has become more transparent to IR radiation in the past 60 years. The “greenhouse effect” has become less. My talk yesterday for the Dutch Meteorological Institute was a great success. There were 10% more attendants than their largest conference room could contain seated, the interruptive discussion was intense, and even sometimes emotional, but always correct, because Hein Haak wielded his power efficiently to keep it that way. KNMI directors Hein Haak and Remco den Besten invited me to write or come to KNMI whenever I wanted, get the support from their specialists when I needed it, in order to continue the discussion that was started yesterday. Very nice, and very Dutch. Thanks to the SPPI blog for the tip, The Hockeyschtick for expanding on it, and climategate.nl for the slides. Popular Tech lists two papers by Andel. Thanks Don B for the link to the Jasper Kirkby paper. Noor van Andel’s full slide set. The latest paper “CO2 and Climate”. Very nice post. The first graph of the correlation between temperature and galactic cosmic rays comes from Jasper Kirkby’s paper – see page 3. The political pressure behind sustainable energy technology development will be the victim if the IPCC looses its credibility. That must not happen. We must find the right climate physics, and the right reasons to keep going in sustainable direction. Not only in energy matters. How does that fit with the rest of his argument? Donna, I think some of what he said gets muddied in translation. I’d guess he is suggesting that in the long run the development of sustainable energy technology will suffer if good science doesn’t prevail at the IPCC. Though I’m surprised he might think the IPCC’s cred could be saved even if they suddenly embraced empirical data. I think he is letting us know he likes the idea of sustainable energy. (Don’t we all, if only it worked). Don B: Thanks for that link. I’ll add it to the post. I’d like to reply to Donna: there is a much more meaningful and urgent requirement for sustainable CleanEnergy than the IPCC fraud: brief description at http://altenergymag.com/emagazine.php?art_id=1673 — it’s Buckminster Fuller’s Design Challenge. This is superb Ms Nova. But may I ask, if this is all so obvious why isn’t anyone who counts paying any attention to it? Robinson: answer — Bluff, bluster and billions of dollars. PS: Ask how many taxpayers have the time to read about the science of global what not? We all assume someone else does. As usual this is a PR war. Science is a tool. But it sure helps when lots of skeptics write letters to editors laden with facts. It slows them down. Read world data shows that when the Earth’s temperature rises it is followed after a lag of approximately 800 years, by a corresponding rise in CO2 in the atmosphere. When the temperature drops, the reverse is true. Basically when the oceans (the biggest CO2 storage facility Earth) heat up, they release CO2. When they cool down, they reabsorb the CO2. This simple fact shows that CO2 levels do not drive temperatures but if anything, the reverse. Global warming is about politics, not science. If a fact can be used or bent to support the hypothesis, it will be. If a fact is inconvient, it is ignored. Politics. I would like to know if this work is up for publication in any of the leading climate science journals. Has it been presented and may we expect it to be given a space in the formal literature or not? Personally I find it fascinating. Astronomy must connect with climate science over this question of cosmic rays. Are there any university departments doing so? But, I would think that wouldn’t I. … this is a PR war. Science is a tool. Not just PR. It is global Government sponsored PR. It is designed to alter opinions and influence behaviours. And that makes it offensive propaganda. And I use “offensive” in both meanings of the word – attacking, and obnoxious. Global warming is about politics, not science. Totally agree. That has to be the manta that we use to kill this beast. It also provides a past-tense weapon to use against the next scam that comes along – for there will be one. Thankyou for publicising this information about real climate science. Those of us who value real science have been waiting for a return to real climate science for a long time. And, as could be exected from Noor van Andel, his analysis is good stuff. Congratulations to him and also to Arthur Rorsch without whose efforts this interactive initiative with KNMI would not have been possible. And it seems that KNMI are offering collaboration with van Andel to assist him with his studies. If that happens then climate science can start to climb out of the morass that the AGW-hypothesis has pushed it into. I see a glint in the sky over climate science: could a new dawn be about to happen? Oh God, please let it be so. As with most conspiracy theories, I find it hard to see the motivation and so tend not to believe them. I think perhaps a “conflation of interests” is a better term for this: some political, some financial, some personal. Anyway, I expect (hope) that after CLOUD reports from CERN, all that will be left for sceptics to do will be to mop up the few remaining AGW stragglers. I do not believe in conspiracy theories either. They require too much thought, they need too much planning, and there is too much risk. What happens is that governments, or businesses, or other large enterprises, find that they are bumping up against each other and getting in each others way. Taken to extremes, this results in conflict between the parties. So they decide to co-ordinate what they are doing to prevent this happening. The best way of doing this is to meet occasionally to discuss plans, and problems, and such. But when they get down to it, there are just so many things that need to be discussed and agreed, that they cannot do it in a series of meetings. So they decide to form a joint body, with permanent representatives to provide the co-ordination. In such a body each representative is deemed to be equal – they are colleagues in removing friction, after all. However the organisations they represent are not equal, so the status of each of the “colleagues” changes to reflect this. At that point, the organisation starts to become political in its own right, and the personalities of the individual representatives starts to become a deciding factor in the decisions made. Eventually, a small clique of the “colleagues” starts to develop the means to control proceedings, and focus the activities of the others (and the organisations they represent) along set lines. This process is continued until a point is reached where the small clique has subtly shifted the mode of operation from consensus of the majority to directive by the minority. From there it is a comparatively small step for the most politically able member of the small clique to be pronounced the President of the organisation to act as a central focus and mouthpiece. Over time, and one directive at a time, the organisation drifts further away from its original purpose of co-ordination between the parties towards one of more direct control over the parties, all in the name of what is ultimately best for all. At that point you have arrived at a supra-government by stealth. No planning. No conspiracy. Just the people in the mix taking the next logical step as it presents itself. This is what has happened with the European Union, and this is what is currently happening in the United Nations. The difference between the two organisations, is the method of funding. The European Union has always had the means to receive regular funding from the member nations, presumably raised through taxation. The United Nations is reliant on regular running costs, supplemented by aid and donations being granted by the member nations. It is this second conduit of funding for the UN that is reliant on the perpetuation of scares. A little confused by the 2 graphs depicting relative humidity. Both graphs have titles of “Specific Humidity (up to 300mb only)”, yet the captions identify them as at 600mB and 400mB. Typo? Other than that, thanks for a wonderfully rounded and concise post Jo. Have already shared it around. The real denier is Trenberth. In Noor Van Andel’s slides, he has documented exchanges with Trenberth where he takes Trenberth to task over different values – observed vs estimate. Trenberth ignores obs values in favour of estimates and elsewhere favours model values. 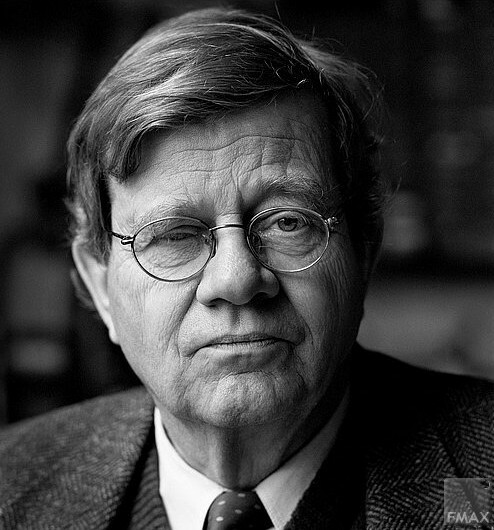 It would be interesting to compile a list of all obs values that Trenberth ignores (denies?) in favour of estimates or model results. It is the law of entropy applied to human organizations. All energy, human or otherwise, runs down hill and eventually becomes part of the cosmic background with which no useful work can be accomplished. The only thing in the universe that has been able to create bubbles of negative entropy for a time are stars and living individuals severally and individually acting consistently and rationally to further what is in fact their own best interests. For human systems, the best instantiation of that principle yet devised is Capitalism. Each is free to work, keep, associate, and trade as he sees fit. None may force another to do what he would not otherwise do. Each pays for his own error and reaps benefit from his own success. It appears to be a law of nature that the instant that two or more humans get together to cooperate effectiveness and production per unit effort starts to plummet. Go beyond four individuals attempting to cooperate on a single project and the falloff really becomes steep. The main problem is with the coordination of thought, purpose, and action by means of communication and meetings. Those things rapidly grow to consume the time and energy available to accomplish anything other than communication and meetings. Various forms of dictatorship – top down command and control – have been used to attempt to solve this problem. However, that requires knowing what is true and acting consistently upon that truth. Groups NEVER know the truth. Knowing is an individual attribute. As a consequence, dictators have universally grown to confused themselves with god and attempt to dictate the laws of nature rather than understand them and use them. That NEVER works. It is the “power corrupts and absolute power corrupts absolutely” principle in action. Large groups can pretend to get large things done but it is ALWAYS at a staggering cost for both themselves and everyone else either directly or indirectly involved. It is actually a net loss except for the constantly growing cosmic background. The larger the project the greater the net loss. If anything actually does get accomplished in large projects, there is a core one to four in the group who are making it happen. The remainder are simply dead weight on the backs of that few. I have been part of that core one to four so many times I have lost count. I have seen no evidence that suggests any other result is likely or even possible. Please interrupt me when you think I’m wrong! He also gives his opinion of the “right” physics at the end of the presentation which is contrary to Trenberth, IPCC, The Team and all the other et al’s. I broadly agree with most of this excluding Miskolczi (which is an incredibly muddled theory which even effectively excludes latent heat etc., and only serves to give sceptical science a bad name IMO). However, quite a few of the graphs which deal with purported global averages and go back before ~1980, most notably the OLR graph, are very well known to suffer from the problems associated with mixing earlier pre-1980 radiosonde data (essentially resticted to one spot on the globe) with later, much more reliable satellite data (which scan vast portions of the globe). This why, for example the post-1980 OLR data shows an insignificant change in OLR. I note that the tropospheric humidity graphs suffer very much from the same problem. It is also interesting to note that while the ISCCP cloud cover data shows a (post-satellites) fall from 1986 – 2000, thereby neatly explaining Pinker’s paper (! ), there has been a steady rise from 2000 – 2010 (last two years missing from Noor’s graph) essentially back to the long term average which is more in line with the (now well known) lack of global warming over the last decade. This is distinctly the reverse of what is expected by ‘Miskolczi Theory’ but seems to have been quietly ignored. Kristina Keneally throws out last ditch bribes to stay in power in NSW. 2HD in Newcastle are reporting that the Premier will squash planned electricity price rises, as well as offering rebates on power bills for house holds with incomes under $150,000 per year. Keneally stating that the Government will absorb all increases in cost for power till 2016. Something tells me it wont work, then again many people vote with their wallet in mind. I look forward to checking the detail, all I know is what I heard on the radio, I’ve had a quick for the story on google but so far no hits. Austerity pulling plug on Europe’s green subsidies. The Spanish and Germans are doing it. So are the French. The British might have to do it. Austerity-whacked Europe is rolling back subsidies for renewable energy as economic sanity makes a tentative comeback. Green energy is becoming unaffordable and may cost as many jobs as it creates. But the real victims are the investors who bought into the dream of endless, clean energy financed by the taxpayer. They forgot that governments often change their minds. The renewable energy bubble was inflated by government subsidies. Those same governments are now deflating them. Turns out the subsidies were too good to be true. These countries were showing signs of subsidy induced stress before Australia took the plunge, WE followed the other lemmings anyway. Regarding the cloud cover changes, I can confirm that the data presented is correct, at least to the extent that this is the data reported by the ISCCP D2 data coming from GISS. This is my plot of the same data. The green line is monthly data, the red line is smoothed monthly data, the blue line is the 12-month running average and the gray line is the 4-year running average. If we relied on wind power, Australia would have shut down…..
More than half Britain’s wind farms built where there is not enough wind…. Shock. Shivering Britain realises wind power needs wind to work…. That would be consistent with Mr M, would it not? My Dutch half is smiling… got to give it to the Dutch, they are more open-minded than most cultures. It is no surprise to me, therefore, that the likes of Yvo de Boer doesn’t mind courting unpopular topics, e.g. when he stated that there is no credible CO2-reducing strategy without nuclear power. The thing about clouds is that the cloud fraction can change very rapidly and quickly adapts to the required conditions. Relative to the planets thermodynamic balance, clouds select the proportion of cold cloud tops and warm surface presented to space such that the average power emitted by the planet is equal to the post albedo power arriving. Looking at clouds from space, the effective temperature is well less than 255K, while the post absorption effective temperature emitted by the surface is greater than 255K. All of the power emitted by the planet ultimately comes from the surface, which ultimately originated from the Sun. When clouds are present, they act as a plug to reduce emitted surface power. Theoretically, clouds can reduce the emitted surface power by 50%. Even if clouds absorb 100% of the surface power, half of this will be re-radiated out into space setting the theoretical maximum to 50%. The ISCCP data confirms this as it shows how cloud top power asymptoticly approaches half of the emitted surface power below them. The bottom line is that the rapid response of clouds picks up the thermodynamic slack when the climate is slightly out of balance, which it almost always is. When cloud coverage is increasing, the planet is too warm and wants to cool, so temporarily, more cold clouds are presented to space instead. The opposite is true as cloud coverage is decreasing. My guess is that Dr Noor van Andel is savvy enough to realize that he has to open with what can be interpreted by a warmist as a pro AGW stance, because if you don’t you won’t get a heard. I have seen this technique used to slip hard science into pro AGW journals. Nice to see your excellent blogs connecting – which has amazing potential! Like you, I agree that there was no over-arching plan to sit down and create the IPCC and force governments to hand over climate reparations as a form of wealth distribution. Unlike you, I have a different definition of conspiracy. Most people think of a conspiracy as top-down driven plan, probably by someone in a secret lair with plans to rule the world. Popular storytelling tends to invoke this worldview, because stories need heros and villains to keep it simple. However, a conspiracy is simply a group of people conspiring together to achieve something which is considered unlawful, or, in political terms, a group of people conspiring together to overthrow or usurp an established political position. I think those definitions suit the entire IPCC-Carbon Trading-Ecoactivist axis quite well. They certainly are not backward about their declaration to end the current political leadership and methods. As for the legality issue, it’s not hard to find evidence of laws broken – the climategate emails are full of law-breaking admissions (mainly FOI, but laws nonetheless). You don’t need an evil genius, secret lair and henchmen to orchestrate a conspiracy – you simply need a group of people working together towards a single goal. The goal is dismantling of the industrial economy and wealth redistribution and eventual population reduction. The group of people working together is self evident. Hence we have a conspiracy. With regards to the scientific paper (and back on-topic) I’m curious to know if they have created a proxy for cosmic rays and cloud cover prior to satellite measurements. You see, my skepticism also applies to papers even if they dismantle the AGW/Co2 scare. Has this been reported in the Dutch MSM? Please correct me if I am in error: The Earth’s climate is probably the most complex dynamic nonlinear system in our solar system. Right? So how can a few hundred extra molecules of CO2 per every million in our atmosphere “force” a catastrophe phase shift in the Earth’s climate? They can’t. Or there’d be prehistoric evidence of such phase shifts correlated with past CO2 fluctuations. Obviously, our climate’s homeostasis is maintained in a state far from equilibrium by a combination of forces that is well beyond the competency of today’s science to unravel. Now that you all bring it up. CAGW does have the same kind of psychological appeal a ripping good conspiracy theory offers. CAGW takes a dramatically complex, dynamically chaotic phenomena—the Earth’s Climate—and reduces it to a one-dimensional morality play with “carbon pollution” as the primary forcing agent. The psychological appeal of CAGW is not just the reduction of complexity to an absurdly over-simplified equation, but also the perversion of dry science into a human struggle between forces of good and evil with heroes and villains. CAGW theory is constructed just like the 911 Truther conspiracy theory. A very complex phenomena—the clash of Islamic & Western Civilizations—is reduced to a bizarre morality play where the primary “forcing agent” is evil Cheney/Bush/Zionists. In both the CAGW and Truther conspiracy the true believers disregard empirical data against their ludicrous pet theories since their imaginary source of all evil just happens to fit hand in glove with their delusional world view and political agendas. German austerity cutting the FeedInTariff: that austerity can’t be that severe: the rep[orted hidden German subsidies for nuclear power amount to Euro 2.70 per kWh and the utility companies earn Euro 1.5million from each nuclear powerstation — per DAY. Thanks, JoNova, for this interesting report about the work of Dr. Noor van Andel. In my opinion Dr. van Andel fails because he adopts the “lock-step, consensus, settled-science” SSM (Standard Solar Model) as the source of Earth’s heat. Post-normal science played a key role in the survival of AGW and SSM. Just as AGW is inconsistent with recent experimental observations, the SSM is inconsistent with decades of experimental data from the space age [1,2]. 1. “Earth’s Heat Source – The Sun”, Energy & Environment 20, pp. 131-144 (2009). 2. “Neutron Repulsion”, The APEIRON Journal, 19 pp., in press (2011). Hey guys, check out this hilarious take on climate change debate! I looked at the video you linked at #37. It consists of a foul-mouthed talking head uttering falsehoods and misrepresentations. It was as “hilarious” as the 10:10 snuff movie, and it was more annoying because it had canned laughter added to it. I fail to understand why anybody would commend others to “check out” such rubbish. Mike — it’s counter intuitive. 300mB is higher (in altitude) than 400mB which is higher than 600mB. (1000mB is roughly sea level). Hence the graphs are from slices of the atmosphere from 400 or 600 up to 300mB. Above that height I gather the air is so dry that humidity readings are unreliable. Hey November@37, nice link! That was absolutely hilarious. Having said that, I reiterate my position – AGW is most likely real, but it will take a few more years to be sure (or to be sure that its not real…). The risk is great enough that we should act now. Words fail me! Richard is dead right – how can sane people find such unmitigated twaddle amusing? One can only surmise that his audience is in Bedlam – or some place like it. Fine. Prove it. Or at least submit a shred of evidence. You may believe whatever you wish, however testifying your faith is mere Trutherism. Naturally, Truthers of all stripes are loath to submit their faith for testing in real time against available evidence. The End is Always Nigh. We just don’t ever seem to get there, do we? By definition an untestable faith that some event will come to pass in the future is prophecy, not a prediction based upon science. Science, by definition, makes propositions that are, at all times, available for verification against observation or experiment. The risk is great enough that we should act now. Whoa, Preacher, you’re getting ahead of the normal course of rational inquiry. If we must wait years to know if AGW is even real, then why should we act now? You know what the difference between a person of religious faith and true believer is CAGW is? Brookes says we should act now, so come on tell us how to tackle climate change? We’ll presume that it’s true ie we’ve increased the co2 content in the atmosphere by 0.01% since 1800 ( on hundredth of 1% ) and we must fix the problem. Remember the developing world is increasing their emissions at a much faster rate than the developed world is cutting their emissions, just one of your small problems. Btw tell us how your ideas will change things and by how much and at what cost. And what is it you propose ‘we’ do? Switch off coal fired power plants? Stop driving vehicles? Stop laying concrete? Stop flying planes? They are the only real actions that would go close to achieving stopping or reversing current co2 emissions. Or do you propose some window-dressing, like a carbon tax, as though people are going to use 25% less of their refrigerator because the power costs more (say, switch it off between 12 am and 3 am). Or would you propose a global carbon trading scheme to funnel money to developing countries, as if that somehow achieves something. Face it, the gate was opened 60 years ago and the horse has bolted. You can’t unwind co2 emissions. All that is left to do now is see whether the theory is right or wrong. Right now it looks wrong. And we’re talking about the ‘catastrophic’ part of the theory – that of tipping points and runaway feedback, not just the small increase of temperature over the next century to warmer conditions. And, if problems develop, develop solutions that fit them. The biggest problems – sea level rise – would be so slow you would have generations to slowly migrate cities away from low lying areas, or to just build sea walls and keep out the sea, as the Dutch have successfully done over generations. The biggest problem with the ‘act now’ argument is that the ‘act’ is just a meaningless bundle of token gestures and feel-good (for the eco-warriors) social and taxation policies. ‘Act now’ is even more absurd in the Australian context, as the most radical cuts here would barely register on the global needle. ‘Acting now’ is just a synonym for ‘assuage my consumption based guilt fed to me by environmental activists’. The most radical co2 cuts on the table today are still like a fat person cutting back from two midnight cheeseburgers to one in an attempt to lose weight. Even the most die-hard greenies are unable to get their carbon emissions down to the required level to stop co2 concentrations rising. The only rational response to all this is to wait and see what happens, and base policy responses on what actually develops, not what some computer program spits out. If Brisbane keeps getting flooded, more Dams and levees. If the Murray Darling keeps drying out, get irrigation water from somewhere else (the Burdekin looks good). If Melbourne starts getting flooded on high tide, a tidal barrier (hey, London has one and so does all of the Netherlands). The worst thing to do is run off on a mass delusion and throw away perfectly good technology and quality-of-life on the say-so of a tiny amount of people who think something might happen but have no proof. And what proof they do offer comes from models with all sorts of variables, any of which might be out by 10, 20, 100, 300%. You can’t do any type of economic plan with that type of uncertainty. None that are worth even the paper they’re written on. So believe it might happen all you like. Just don’t ask others to take you seriously when you want to ‘act now’, as if it was a simple case of taking the garbage out before the truck gets here. There is a great risk that when you cross the road you will be hit by a car so obviously dont cross the road. This analogy can be applied to every facet of your life. Not everyone is ignoring it. Basically they accept that the ocean is cooling slightly but only in the very small area were they are measuring, overall of course the oceans are still warming. This was countered by a request to produce THE study which shows the oceans have warmed from 1957 to 1998, a study that has data from all corners of the globe and not from a very small sample. I then mentioned ARGO is the only data set which is world wide and it shows a cooling. As expected the debate has fallen into the gutter which is standard practice by the believers when they are confronted with difficult questions. Bulldust at 29. It has been said that every Dutchman is his own theologian. The religious nature of AGW would have problems in Holland. Ask the Pope about the Dutch Church. During the second World War the Dutch medicos in the Japanese Prison camps did not amputate limbs because of tropical ulcers. They had learnt to treat the ulcers. However the British and Australian medicos wouldn’t listen to the Dutch medicos and loped of many limbs. “we should act now” says John; I agree; I see you, John, in the role of Yorric; start rehearsing immediately. That of course should be “Yorrick” which I repeat is a role crying out for John. I’d like to thank NOVEMBER@37 for the link. Jonathan Swift couldn’t have composed a better satirical representation of the self-righteous CAGW bigot than Bill Maher has! Thanks for the gift, Bill. Bookmarked. Again, I’d like to ask: What is the difference between a person of religious faith and a CAGW true believer? Most thoughtful people of faith understand that their beliefs are based upon divine mysteries that transcend merely human logical analysis of verifiable observations. Only the uninitiated would try to explain the divinity of Christ, the concept of the Holy Ghost or the miracle of the Koran using the language of science. Besides, that would defeat the whole purpose of faith, which is to sort the believers from the non-believers. The real world is facade to the faithful, the bulk of worldly evidence tests one’s faith, never confirms it. Therefore faith can never be based upon evidence. Evidence exists solely as the basis for reason. Therefore, reason can never be based upon faith. Bill Maher’ sanctimonious rant demonstrates the inability of the CAGW true believers to separate the realm of reason from that of faith. Bill’s arguments aren’t rational, but he believes they don’t have to be because the CAGW faith is “self-evident.” It’s self-evident that there are more storms, floods, drought, disease and death and that it’s hotter now than ever before in recorded history! If you are a non-believer – if you require a rational inquiry into the evidence – then it’s fair to dehumanise you as a vile and stupid denier. Pathetic and hilarious. Clinging to insults and faith. It’s all they got left, folks. Of course the emphasis must be on “thoughtful”; the fact is a lot of effort is made by religious folk to have the imprimatur of science applied to their faith to provide that degree of validation otherwise not present to seperate their emotions from superstition and the like; one only has to look at the legal cases involving Creationism amd Intelligent Design, a process which began with the Scopes trial. Now if a faith or belief has legal status it becomes very formidable indeed; for instance in Britain an acolyte of AGW sued for religious discrimination because his employer did not take his belief in AGW seriously; at a hearing in 2009, Judge David Sneath ruled that the acolyte’s convictions amounted to a philosophical belief under the Employment Equality (Religion and Belief) Regulations, 2003, and that he could, therefore, can claim discrimination. True, Cohenite. A certain kind of charlatan appropriates scientific sounding language as a evangelical device, a la Al Gore, 911 Truthers and some Creationists. And some people will naively believe that their faith can be substantiate by invoking the logic of rational inquiry. No doubt in the modern secular world where science is the only universally accepted form of “knowledge” by our atheistic cultural elite, many “faiths” feel compelled to cloak themselves as reasoned arguments. Science Fiction. It’s the dominate artistic genre of our day. Yet science has nothing to say about faith, because science can only contain statements which can be tested as either true or false. Anything beyond that falls into the realm of faith. Faith, likewise has nothing to say about science since it contains no fundamental propositions that can be determined true or false by reference solely to empirical observation or experiment. Therefore, John Brookes claims (hopes) we will have to wait and see if AGW is real. No testing now, please. Then he makes a plea for action—whatever that means— based on his faith rather than evidence, which he admits is lacking. Pure faith disguised as reason. A very dishonest game indeed. This is not to declare honest faith-based belief systems (or syncretic art and ethics) as possessing no value as “knowledge.” Quite the contrary. Humans are by nature both physical and transcendental beings. If all that lies beyond what is verifiably empirical is an unknowable abyss then we would be dumb beasts indeed. Faith is a fundamental characteristic of all methods of inquiry beyond the limits of empirical science. My point is that climatology lies entirely within the realm of empirical science. Climatology can never have anything to say about ethics, or faith, or metaphysics or angels. There can be no faithful or unfaithful or believers and deniers, only hypotheses subject to the dry rules of scientific methodology. Yet the CAGW truthers would befuddle and inveigle us all by mixing what should never have met. Just wondering how well this theory explains upper stratosphere cooling? This sounds reasonable to me. The only issue at contention here is which are the chickens and which are the eggs? Unlike Miskolczi who posits some secret Hungarian force that dehumidifies the atmosphere in order to cool it (and the surface,) I prefer the view of Roy Spencer that we don’t actually clearly understand the chain of cause and effect here. Intuitively one would think that increased surface heating increases ET which increases humidity which increases the likelihood that clouds will form. However, as Australia ‘basks’ under a La Nino (cool western Pacific SSTs) we’ve never had so many clouds and never had so much rain (and now cyclones). I think it is possible the secret ingredient we’ve forgotten is CCNs (Cloud Condensation Nuclei), that most CCNs are biogenic and we can mostly thank the oceanic cyanobacteria (and the equatorial trees) for managing this all for us. So it’s not the rapid response of the clouds per se, it’s the rapid response of the photosynthesizing biomass (responding to the increased flux of PAR – short wave UV at the surface) which facilitates the ‘picking up of the thermodynamic slack’. Those of us who are thermodynamicists by trade know full well that thermodynamic disequilibrium often needs a ‘seed’ or ‘nucleus’ that permits the action/reaction which is the rush back towards equilibrium. Chemists talk about ‘heterogeneous nucleation’ and the barrier of the ‘Interfacial Energy’ and the ‘Ostwald Step Rule’ but the principle is universal. Amazing it seems that Brookesy is as big a sook as Luke over at Jennifer’s blog, big on cagw but a real big jelly back when asked for solutions. They are up front know it alls when espousing the theory of co2 causing all sorts of problems for the planets future but are struck dumb there after poor luvvies. Sorry, I’ve come into the debate a bit late. Jo, I think that Donna is quite right to be concerned/confused by that opening statement which really needs clarifying by Dr van Andel. Before you put it down to translation problems you have to bear in mind that the Netherlands is a very tiny country surrounded by big powerful neighbours. This means that Dutch people with a minimum of education are usually fluent in German, French and especially English, so I think we can take it he means what he says. That aside, it looks to me like he was taking elaborate oratory precautions in front of a potentially hostile audience. So one perhaps shouldn’t be discouraged by that from entering into the body of the text. It appears to be a law of nature that the instant that two or more humans get together to cooperate effectiveness and production per unit effort starts to plummet. This is known as euphemistically as “Brooks Law”, after Fred Brooks, the author of “The Mythical Man-Month”. In its simplest form, it is concerned with the number of communication paths required within a group of people, for all members to have access to the same information. It is expressed as n(n-1)/2, where n is the number of people. (The formula also has relevance for the time required for a meeting where everybody has to have the right to speak, and the right of rebuttal). Where people need to collaborate on achieving something, the relationships get much more complex. Thanks for linking that… now I have identified one more tool I never have to watch again. Maher’s ignorance (or is it arrogance, or both?) clearly knows no bounds, very sad attempt at comedy and completely misses the mark. Even AGW attempts at comedy come up short, lacking punch… funny that. Some say that because CO2 is a greenhouse gas we “must reduce our CO2 emissions” to prevent a runaway heating effect. They forget that in the Ordovician age CO2 levels are estimated to have been more than 15 times present levels even just before and during an ice-age. Does that indicate that CO2 is adangerous heat-generator ? And what’s this about “we must act by reducing CO2 emissions” ? What !!! Is it seriously suggested that we should reduce something which just possibly —just possibly— might be a contributing factor to an extremely small (0.6 C per IPCC 4AR) temperature increase in the 20th century ? Also —don’t tell us that recent changes “are unprecedented”. Such statements are from people who have not undertaken even the basic research..
At this rate, some boffin is likely to tell us to make all our drinks with cold water only — because boiling water emits water vapor —another greenhouse gas. If the global temperature (use the UAH satellite record, if you don’t trust the ground based thermometers) keeps tracking higher, following the IPCC range of predictions, at what point will you guys stop saying that there is no problem? After a pretty hot 2010, this year is looking cooler. 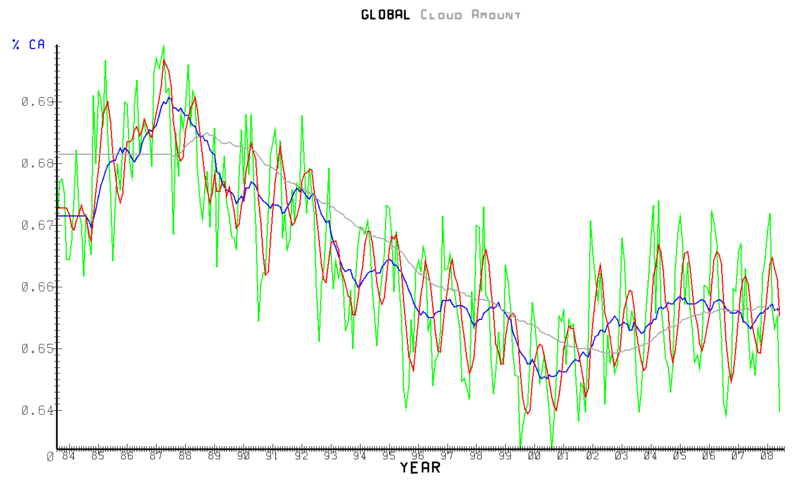 So if the next 3 years or so drop back to say mid 1980′s levels, that will cast real doubt on AGW theory. If the next 3 years keep trending up, then it just gets harder and harder to say that the warming is natural or benign. As for what to do about it – nothing will work unless the problem appears urgent. This is not the case now, so nothing will happen. IF AGW is real and dangerous, then some time in the next few years there will be a disaster that appears to be directly related to AGW. If it then becomes obvious that the costs of mitigation will vastly exceed the cost of prevention, then you will have action. It will have to be a very serious disaster, because otherwise the current attitude of putting your own welfare before global welfare will prevail. If it becomes totally obvious that something needs to be done, then we will do it. Humans are pretty clever – we can figure this out. Here is a novel idea John. Proponents of AGW believe AGW is totally obvious, “we need to act now” they say. My solution is..
A price of $50 per tonne is put on carbon rising by $10 per tonne per year. Prices of all goods and services (utilities, food, airline tickets, petrol etc etc EVERYTHING) reflects this price. HOWEVER, each of these goods and services display TWO prices, one with carbon tax, one without. Those who believe action is imminent, voluntarily pay the higher price. Seen as so many people believe AGW is real (according to some polls) there should be no problems raising enough taxes to fund all sorts of green energy initiatives. What else can be as democratic? What else can indicate the TRUE beliefs of people than that? You and your ilk can SAVE THE PLANET in a very peaceful way at your pace. Is it as urgent as Gore and Hansen and Flannery et al say? great, pay straightaway. Not so urgent? that’s great too, start paying in a few years time. The true believers receive their Gaia blessings, us heathens/deniers don’t get hassled, everybody is a winner. Our grandchildren will thankyou IRREGARDLESS of whether AGW turns out to be true or not. John you seem to have a very funny way of proposing some extreme problem that will then make all of us sit up and take notice. When we ? decide that something must be done you had better hope that the developing world agrees as well, because without them you will just be wasting billions for zero return, about as sure a bet as you could hope for I’d say. My solution of course is adaptation and investment into research and new technology. If you have future droughts or floods whatever you must adapt in the most sensible way possible and not pin your hopes on solving future climate problems by concentrating on the reduction of co2, because I’m sure it will be a total waste of time and money. I’m in the middle of reading an entire book, by a lifelong environmentalist and former AGW believer, dedicated to this topic. Very interesting, if somewhat repetitive. The first half of the book describes the science,with an emphasis on new research into ocean circulation, solar activity and cosmic radiation, and cloud cover. The second is dedicated to the politics of the AGW movement. Yes, all very well, but you keep skipping around the point. You urge us to act now, or at least in ten years, or when some disaster happens. Fine. You’ve said we need to act. We understand you very clearly on this point – the need for action. I ask you : when you ‘act’ what are ‘we’ going to do? Action is all very well, but what’s the plan? I think we need to ‘act on world peace’. I have no plans or ideas how to make this happen, and I don’t intend to suggest any. Does my statement sound like useless waffle to you? Again, I ask ; please share your plan of action. A realistic plan, not some hand-waving waffle. How are you going to make large cuts to worldwide co2 emissions? Tracking higher? Even accepting all the data from East Anglia and NASA as gospel, there is one undeniable fact. Temperatures have not tracked higher in 12 years! 2010 was the “hottest on record” except it only TIED 1998. And even if you throw in 2005, that means that 10 of the past 13 years have been lower than 1998! Hardly a “tracking higher” claim – and that is accepting the high priests of AGW’s figures at face value! And as far as “doing something”? Use this analogy. Next time you get a rash – go to the doctor – and when he says he does not know what is causing it – tell him to medicate you for everything! Just in case! That way at least he will be “doing something” about it. You may not survive the process, but why should you care? You will die knowing that he “did something”. Well Baa, there is a problem with your idea. I happen to believe in education, and think that my taxes should contribute to providing schools. But maybe we should follow your idea, and make taxes voluntary. So those who don’t believe in the army could elect not to pay the army part of the tax. Similarly with private property. I can’t opt out of this system and expect to get away with it. When I’m up before the magistrate, I don’t think an argument that I didn’t agree with private property and therefore I shouldn’t have to respect it would cut much ice. Why can’t I? Because it serves the greater good if everyone respects private property. So yes, if you want to guarantee a failure to tackle AGW, have a voluntary system. As I said above, I think that meaningful action will only follow a fairly dramatic disaster. Until then we are just frogs sitting in a pot of slowly warming water, ignoring the obvious. If the US, Europe and Japan decided on action, the developing world would have to go along, or lose their markets. There are only a couple of hundred countries in the world, and getting the major emitters onside will not be a big problem – provided they see a need to act. You don’t think temperatures are going up? Well, they are doing a pretty good impersonation of it. But like I say, if they stop tracking the IPCC predictions for a few years (barring volcanoes etc), then we’d need to look at things again. But right now, we’ve pretty well reached the end of the “its natural variation” argument – any further rises just hammer nails into it. How to make large cuts to CO2 emissions? Well, I’d put a price on carbon, and let the market sort it out. You may not believe we are smart enough to cope without burning fossil fuels – and if that turns out to be the case, then we just burn fossil fuels and put up with the changing climate. Whichever one turns out to be the lesser of two evils – do that one. Aww rubbish John. Education and defense are not reliant upon individuals beliefs. they are a necessity for all communities large and small. Likewise roads and bridges etc. But this AGW thing isn’t going anywhere, nothing is happening. Look at NSW, they just axed a whole bunch of green initiatives. As did various EU nations and others. So if you want something done, you can do it voluntarily. If you think it can be done by governments “forcing it’ upon the public, you had better get in touch with Gillard and Obama and let ‘em know how to do it. They’d love to hear it. With the science reputation in tatters and mum nature not playing ball, you got 2 options. Do nothing but stop bleeting about it, or do it voluntarily and get it done. Reminder. People gave freely and happily to help flood victims. as soon as Gillard decided to tax it out of people, even at the very nominal rate of $1 per week, all hell broke loose. Reading around the blogs (especially Drum Unleashed) there must be hoardes of people waiting to queue up to save the planet. IT’S URGENT DON’T CHA KNOW? THE MORAL CHALLENGE OF OUR TIMES. Are you and your fellow “we must do somethingers” up to it? Time for action John, hop to it. p.s. John. Making a statement that we are ignoring the obvious insinuates that skeptics are ignorant. If the A in AGW is so obvious, how come none of you, from the celebrated expert scientists to concerned bloggers like Cooke and Tamino, have been able to come up with any empirical evidence? Maybe not so obvious ha? Or maybe your side is so incompetent, they can’t convince enough people of the bleeding obvious. And most of ‘em are teachers, professors etc. Do you see a message in there John? It is not what “I think” or “you think”. Opinions are like bung holes – we all have one. Let’s use empirical data. Plot the average global temperature from 1998 to 2010. Then draw a trend line. What is the direction of the line? And as for the “natural variation”, please show us your supporting work that shows when it starts and stops. Quantify the effect of the natural variation so we can factor that out of existing temperature data. Please do so, since no one (not Mann, Jones, Trenberth or Schmidt) has YET DONE SO. That would be a BIG first step in proving your opinion and convincing all of us of the scientific basis for your statements. John, you don’t seem to ever change. 1) Temperatures are getting warmer as we come out (GISP2 Greenland Core) of the Little Ice Age, one of the coldest periods in the last 10,000 years. It’s a good thing that temperatures are warming up — the alternative is dropping into the next Grand Ice Age, which is a) Overdue, and b) Would be a real bummer for civilization (unlike a few degrees of warming). 2) The only way current temperatures can be said to be “following the IPCC range of predictions”, is if you expand the uncertainty bands to include anything that might happen. The demonstrated predictive skill of the AGW hypothesis is nil. A) Currently, there is a political contingent that is trying to use fraudulent “science” for political gain. In particular, this contingent wants to severely limit individual liberty and increase governmental power — the usual totalitarian push. B) There is a real chance we are (or will soon) start into the next major glaciation period of the current 3 million year long ice age. Pursuing policies that limit access to power and wealth for the majority of Humanity is exactly the wrong thing to be doing to prepare for this eventuality. If it’s predictive skill that convinces you, then why don’t you transfer your misguided belief to an hypothesis that has actually demonstrated some predictive power? Here’s a discussion of the GISP2 ice core, showing that the current warming trend is minor compared to past temperature swings in the Holocene. This ice core has been attacked by some warmists as not representing a global average. They are correct. However, it shows that temperatures in Greenland have been rising at a rate and to a level that are both overshadowed by past changes. Therefore, this data falsifies the warmist claim that Greenland is warmer than ever, or is melting at an unprecedented rate (unless you confine your comparison to the Little Ice Age). The same general pattern can be seen in every long term temperature proxy at a specific location (e.g., the Sargasso Sea). It is only when compared to constructed “global average” temperatures that any given location variation might look large. However, it is not valid to compare a specific temperature record to a “global average” — the only valid way to say that temperature rate of change or value is “unprecedented” is to show that it hasn’t happened before at that location. Additionally, a “global average” temperature has no scientific meaning (indeed, there is no scientific definition of “average temperature”). These averages are mathematical constructs without physical meaning (although they seem to have political utility). John Brookes: I’m sure we would all be fascinated to hear your analysis as to what is wrong with Noor van Andel’s data, methodology, or conclusions. After all, that is what this thread is supposedly about. You seem to have just skipped right by with your blatant assertion that “AGW is most probably right”. Since the rest of us haven’t had your (apparently) divine revelation, perhaps you could enlighten us? Not sure folks have seen this yet so thought I might pass along. Burt Rutan (Renowned engineer & Aviation icon)spoke recently on AGW. His video is located here. The pdf of his charts is here . links taken from this site “Burt Rutan’s comprehensive new report on Global Warming science fraud”. Further, if one plots human CO2 in the entire entire atmosphere on a grid, the result is about 1 in 40,623 cells (~1 cell on a 200×200 spreadsheet). Thanks for that link. Carlin has more sense than most of the PHD’s promoting AGW. Clouds are certainly enigmatic. 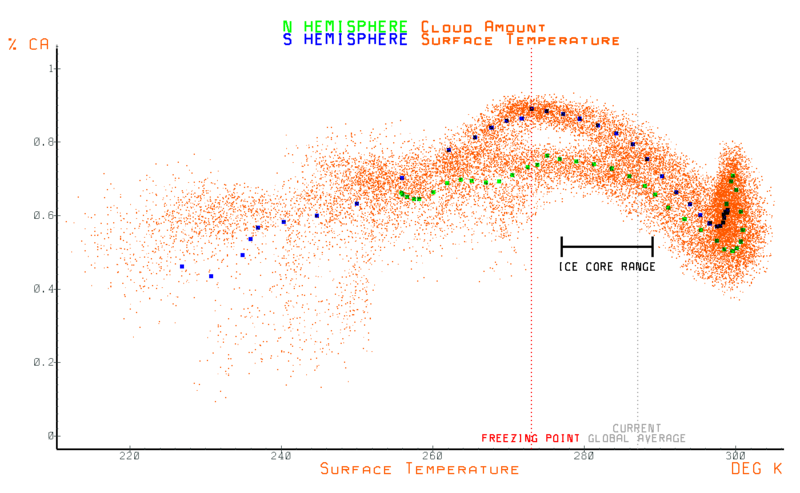 Consider the following scatter plot of temperature vs. cloud cover. As the temperature rises to freezing, cloud cover increases, but as the temperature exceeds freezing, cloud coverage decreases as the temperature increases, which is somewhat counter intuitive as you would expect more heat means more evaporation which means more clouds. Further examination of the data reveals why cloud cover vs. temperature has 2 reversals, one at 273K (0C) and another at 300K. Below 0C, the ground is covered in ice and snow and is as reflective as clouds, thus incremental clouds warm the surface by trapping surface heat. Above 0C, the ground becomes less reflective than clouds and incremental clouds reflects more power than is trapped, thus incremental clouds cause surface cooling. Above 300K, so much water is evaporating, incremental solar power actually causes net surface cooling (at least over the oceans) and incremental clouds again result in warming. So, while nucleation sites are required to form clouds, whether or not the clouds persist or evaporate is driven by the much more powerful requirement for radiative balance. Who will be the first to blame global warming for cyclone YASI? Tropical Cyclone Yasi is a “tragedy of climate change”. On the ABC she says the cyclone is another example of why it is important to cut carbon pollution. “This is a tragedy, but it is a tragedy of climate change,” she said. The years 10+ years of the 21st centuries had half this number / year with an average of 9/year. These are facts available on the BOM website here. Again we have the ABC reporting Greens political propaganda without question. The ABC’s independence is now beyond a joke, it is positively embarrassing. Hopelessly silly and inaccurate John, have a read of this. Have you by any chance drawn the attention of Roy Spencer to this graph (st_ca.png)? I can’r see any thermodynamic reason to believe that 300 K (26.85 C) inflexion is a constant? I would guess that it is just a global average (or near to it – depending on the database) and may vary locally/regionally depending on the nucleation rate of clouds? I also note that there is some ‘fuzziness’ about how to actually compute ‘cloud amount’ (CA) and have played around with various ways of computing it myself. Incidentally the 2nd URL has a comma after the www but I soon picked up on that. I’ve also now looked at all of your graphs @ http://www.palisad.com/co2/sat/ They are very interesting (and very easy to follow). Can you identify the sources of the data for those graphs? They appear to be the conventional sources one would expect – NCDC, NOAA etc? Seems to me like you have only got your Apache site up recently – hence the lack of an explanatory front end? But I’d be very interested in a private discussion with you about some of this cloud-related stuff – if you wished you can get my email by clicking on my name or at my web site. The source of all this data is the same ISCCP data that the cloud coverage data comes from. The data has no processing applied by me, other than the minimum required to plot it. There are assumptions involved with calculating cloud coverage, but these assumptions are thought to be constant across the ISCCP data set. It mainly has to do with the threshold for determining what’s cloudy and what’s clear. The 300K point seems to be a consequence of the almost asymptotic behavior of the water column, relative to temperature. It seems to be the process that limits ocean surface temperatures to about 300K. I don’t have this next analysis at my fingertips, but I believe that if you calculate the rate of evaporation as a function of temperature (assuming nominal pressure), 300K is the point where the latent heat removed is equal to the arriving solar power. “Spring comes around and Al (Gore) thinks it’s Global Warming”. Poor ol’ JB, he thinks it’s the same here in Oz now that summer has well and truly arrived! John, try not to parse this into something which suits your belief system. So, rising CO2, a temp. increase of a mere 0.7 deg. in the last hundred plus years and ocean cycles about to go into a cooling cycle. The fraudsters know this and that’s why the crescendo of screeching and squawking currently. They wanted a mandatory international regime in place so that when temperatures fell they could claim success. Despite the uncertainty in future climate change impacts, it is often assumed that humans would be able to adapt to any possible warming. Here we argue that heat stress imposes a robust upper limit to such adaptation. Peak heat stress, quantified by the wet-bulb temperature Tw, is surprisingly similar across diverse climates today. Tw never exceeds 31C. Any exceedence of 35C for extended periods should induce hyperthermia in humans and other mammals, as dissipation of metabolic heat becomes impossible. While this never happens now, it would begin to occur with global-mean warming of about 7C, calling the habitability of some regions into question. With 11-12C warming, such regions would spread to encompass the majority of the human population as currently distributed. Eventual warmings of 12C are possible from fossil fuel burning. One implication is that recent estimates of the costs of unmitigated climate change are too low unless the range of possible warming can somehow be narrowed. Heat stress also may help explain trends in the mammalian fossil record. I would have thought that what Sherwood is proposing is double-dipping, using the same energy twice; that is the heat used to evaporate the water is counted again as the latent heat of the evaporated water; or am I missing something? As for what to do about it(AGW) – nothing will work unless the problem appears urgent. This is not the case now, so nothing will happen. IF AGW is real and dangerous, then some time in the next few years there will be a disaster that appears to be directly related to AGW. If it then becomes obvious that the costs of mitigation will vastly exceed the cost of prevention, then you will have action. It will have to be a very serious disaster, because otherwise the current attitude of putting your own welfare before global welfare will prevail. I know it’s sad to always pile on poor Johnnie. But he reliably provides the most egregious examples of CAGW tropes for our analysis. The quote above illustrates the common moral dilemma that faces members of any kind of doomsday cult. By definition, a doomsday cult derives ALL its power and funding through its prophecy of apocalypse. The prophesied doom must be imminent, of course, or the cult wouldn’t attract many converts. This poses the problem of doomsday deadlines not met, and with failed deadlines the resulting derision of non-believers heaped upon the cult. Derision our poor Johnnie knows only too well. It will have to be a very serious disaster, because otherwise the current attitude of putting your own welfare before global welfare will prevail. Ironically, Johnnie and his fellow CAGW truthers have descended to the morally degraded state of secretly—or perhaps not so secretly—wishing death and destruction upon others, the very kind of death and destruction their cult supposedly dreads!… By now anything with a high body count will do. Floods are fine, no matter if they are self-fulfilling, aggravated by Green opposition to the very kind of hydro-engineering projects which could have prevented the disaster. Heck, a really great cyclone is an even better catastrophe! Even if occurring in a part of the world where cyclones are historically known to be a yearly risk. Doomsdays are doomsdays. Now the wrath of Gaia is bearing down upon Queensland’s northern shores and tens of thousands of lives and livlihoods hang upon whatever a weather system does next. Pious Greens doomsayers everywhere are smirking with satisfaction, hoping Yasi’s the disaster we have to have… meanwhile what’s left of their moral authority spirals, like a miniature cyclone, down the proverbial drain. I see Milne has already blamed AGW for Yasi; what a dreadful person. You have it right, it’s a case of double dipping. In fact even counting the actual back radiation from the atmosphere as a new source of heat is double dipping (the half of atmospheric absorption that does not go into space). This is a consequence of treating this power as ‘forcing’, when the concept of forcing strictly applies to energy entering the system. The only valid way to even refer to back radiation as forcing is to either subtract it from solar power first or to redefine forcing to be something that it isn’t (what the IPCC does). Sherwood’s supposition is that if the climate warmed by 7C, then the wet bulb temp limit would be greater than 31C (304K). The problem with this is the if. Since the oceans are effectively a big wet bulb thermometer, cover 2/3 of the planet and are currently limited to 31C, how would temperatures ever get 7C warmer in the first place? This would require the average land temperatures to be more than 14C warmer! The warmists are confused about Venus because there’s a significant difference they fail to account for. The bulk of the Earth’s thermal mass is comprised of ground state water below the surface, while the bulk of the Venusian thermal mass is comprised of energized CO2 above the surface. The Venusian surface has more in common with the bottom of our oceans, which like the Venusian surface, has a constant temperature independent of day/night or seasonal variability. It’s ironic that the same physics that limits the wet bulb temperature limits the maximum Earth temperature and yet Sherwood sees fit to suppose this isn’t true in order to support his speculative hypothesis of CAGW. Following posts: 19, 26, 28, 30, 54, 56, 77, 81, 82, 85 and 88 all very interestuing to me. This issue of double-dipping by the CAGW alarmists into the ability of the atmosphere is central to the whole problem with them and their inability to even attempt to understand the key but complex role of clouds. It seems to me that as well as the simple physical effect of all that water there is an additional biogeochemical effect in operation over the oceans, probably somehow associated with the magnitude of the world’s ‘standing crop’ of cyanabacteria and over the continents the live biomass of the (mostly equatorial) forests. over the continents) via the rate of transpiration through (C2 and C3) plant leaves. It is useful to note that the rate of annual ET over land is a simple LIMITING function of the average rainfall AND the % land cover in forest, heathland etc. This explains over 97% of the variance of land based ET (Zhang et al). George notes the additional effect tries to limit the wet bulb temperature even lower at around the point where the latent heat removed balances the incoming flux. I am going to check this calc but I am sure you are right George. The key point here is that the incoming flux is largely short wave not long wave and a fixed fraction of that supports photosynthesis. I hope you guys don’t mind but I’d like your agreement to drawing the attention of my friend Jeff Glassmann to this 3-way discussion on this thread? Thanks for all the advice and criticism guys. Not much point addressing the points you raise, as time will tell if you are correct. I was chatting to a fellow AGW nut case on our ride this morning, and the idea of a tipping point came up. No, not that tipping point, but rather the public opinion tipping point. That is, at what point will the public come to regard AGW skeptics in the same light as people who don’t think that smoking is harmful? To be fair, it could go the other way, and reach a point where the public view AGW proponents as doomsday cultists [SNIP]. With 1998′s record heat, and Al Gore’s book & movie, public opinion was favouring the AGW side, but a concerted effort by a noble band of skeptics has seen public opinion swing back the other way a bit. So which way will it tip, and when? That’s interesting info about Venus. I’m sure you are aware of other Venusian characteristics such as sheer atmospheric density and proximity to the sun. That’s not mentioning the peculiar retrograde rotation which means that the Venusian day is longer than its year. My question would be which of all those factors is mostly the cause of the furnace-like conditions and is a ranking possible? where T is the critical temperature, Psun is the incident solar power, Psurf is the emitted surface power at the critical temperature, o is the Stefan-Boltmann constant and Pevap(T) is the latent heat rate as a function of water temperature, which is different from the latent heat as a function of water temperature which actually decreases slightly as temperatures increase. The rate however increases faster than the latent heat decreases. For a critical temp of 304K at the equator (Psun=2*341.5 W/m^2), Pevap(304K) is equal to 199 W/m^2, requiring the evaporation of 83 ug/sec per m^2 of water at 2400 KJ/kg, or about 300 grams per hour per m^2 which is about 30 mm per hour, representing about 10% of the critical water column of 3 gm/m^2. From the heuristic exp-(7.2-.03236T), where T is in degrees F and the result is in lbs/ft^2 per hour, .0128 lbs/ft^2 per hour evaporates at 304K (87.8F), which is about 63 grams per hour, but this is for a closed, vented tank with no wind. Wind significantly increases evaporation and an average of 5-6 MPH would be enough to increase this by the required factor of 5. This is not the definitive calculation, nor does it account for the dependence of emitted surface power on solar power, or the dependence of wind speed on temperatures and it assumes equatorial insolation, but is just a sanity check to see if the numbers are all in the ballpark, which it seems they are. 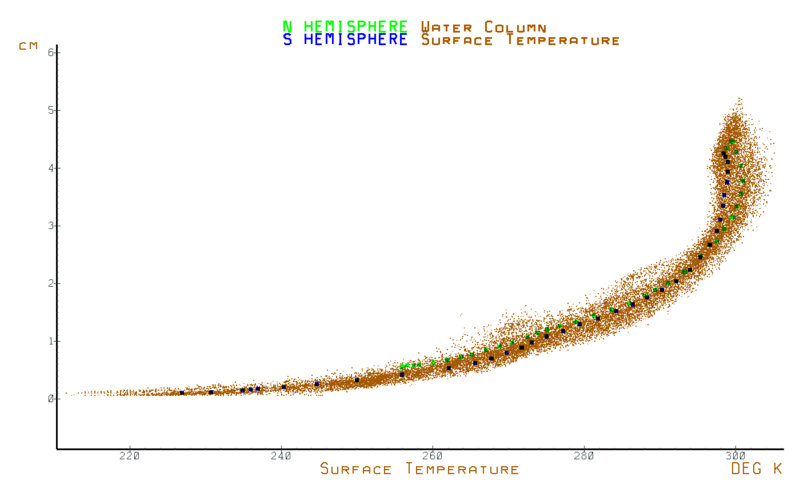 It is interesting that the exponential heuristic has a form which is similar to the surface temperature vs. water column plot. The big reason is that the thermal mass is comprised of energized CO2, rather than ground state water. The fact that it’s closer to the Sun certainly matters, but if the Earth was that close, all else being equal, it would certainly be warmer on average, but the poles would still be frozen, at least in the winter and more than just the middle 20 degrees or so of the planet would be at the evaporative limit, so there would be a whole lot more rain and snow. The Sun provides an estimate of Earth’s global average surface temperature within 10% as accurate as IPCC’s best effort using temperature measurements themselves. Holy crap, Batman! Why is this information not out there is general public circulation? Really? I did not know that! Hello? Moreover, to the extent that man might be influencing Earth’s temperature, the effect would lie within that 10% not taken into account by the models, at most one eighth the effect of the Sun. Wow, from this one could estimate the possible upward limit hypothesised anthropogenic effects could exert on the Earth’s climate? So what does that number, hypothetically, look like? Wait, don’t tell us, it’ll spoil reading the paper. Is Jeff saying that the current models assume no variablity in solar radiation? Because the fingerprint of solar radiation appears on Earth’s surface temperature, that temperature cannot reasonably bear the fingerprint of human activity. Please explain to us why this isn’t one of the seminal works of climatology in the 21 st century??? “Can the Warming of the 20th Century be Explained by Natural Variability?” IPCC’s answer can be read as affirmative, but with no more than 10% certainty. AR4, FAQ 9.2, p. 702. IPCC’s data on which it relied show that the answer is “Yes” with high confidence, and that the cause of the variability is the Sun….This Solar Global Warming model is a competing model to AGW, based on the same data. It necessarily contradicts several more arguments, claims and derivations made by IPCC. So Jeff is saying that using the IPCC own data one can show the solar radiation variability is the cause of climate change, rather than CO2???? If so then the skeptics can agree with warmists on the basic datasets, even if their analysis leads to different conclusions? So now we have a Solar Global Warming Model for climate variation? Shouldn’t that be called a Solar Climate Variation model or something, since solar radiation variation can also explain recent past cooling? wow. Got a lot of reading to do now. In relation to George’s comment @92 concerning the evaporative parameters, one of the confounding aspects of backradiation has been the assumption that it has the energy to heat the ocean and so supply Tremberth’s missing “heat”. The Ablain and Cazenave papers on Steric sea level rise and the Knox and Douglass paper on the coupling between SST and OLR have put dints in that. But in terms of the mechanism by which DLR can actually penetrate and heat the ocean mass much seems to be assumed. The other is by turbulence which was argued in a Real Climate thread but I don’t have the reference. In any event the argument appeared similar to that in a paper by Johnson et al (2007), which provides a mechanism for abyssal heating by non-ubiquitous deep convection currents. It seems to me that a comparison between night and day evaporative levels may resolve the issue but I don’t know if such measurements have or are capable of being done. Email me and I’ll email you back a Dropbox folder where you can pick up an Excel spreadsheet I made some time back back which essentially tries to predict the maximum global average wet bulb temperature through the cloud growth phase (to 100% cloud cover) using as much available literature data on global heat balancing as I could find. This included the K&T97 ‘balance’, the NRA ‘balance’, the original Loeb et al. ‘balance’, the so-called ‘optimal’ Loeb et al ‘balance’, the ISCCP-FD ‘balance’ the T,F&K09 ‘balnce’ and the JRA ‘balance’. This (global average) extremum is predicted to be about 24.75 C under maximum non-thermodynamic equilbrium conditions at 100% cloud cover development. I would expect this to be roughly equivalent to your 26.85 C inflexion. The fascinating thing is that all the so-called mainstream published global heat balances are consistent with a non-equilibrium system which exhibits as upper limit to the average global surface wet bulb temperature of somewhere around 24.75 C otherwise latent heat transfers from the surface enter the realm of fantasy and are inconsistent with a world which had already reached 100% cloud cover! John, how about a “scepticism” tipping-point? The idea that one day people will start being sceptical of crank websites and crackpot theories that appear on blog pages? can you provide a link to where the olr data graphs come from? i too have questioned the decrease in olr and i wrote a post on american thinker here . be safe if you are in the path of the cat 5 cyclone. i enjoy your site and keep the great posts coming! To my mind “climate science” is now undergoing it’s own (long overdue) “Jasmin Revolution”. Long live the thermodynamics approach to climate science. The Government (AGW) and the main opposition (main stream sceptics) are being revolted against by the people (“radical” sceptics – commonly referred to by the Gov. and main opposition as nuts, and cranks). questioning the principles of AGW. For example, the K&T plots depicting a supposed “greenhouse effect”, if the climate system on earth was represented by a picture of a mature forest, then the K&T plots are merely a brown sheet of paper. is about as much use as main stream sceptics have been to date. There are a lot of well-educated people out there who, since the advent of the Internet, are able to exercise their minds in public as it were. and why shouldn’t they. Even world politics is now benefitting from the manifold ‘awakenings’ which the Internet clearly allows the human race. There are many out there who may work in other fields which still involved rigorous academnic and on the job training which might be relevant to specific aspects of climate science (in my case MS., PhD 35 years experience in geochemistry and chemothermodynamics). Much of climate science is a relatively new field dominated by many relatively young scientists and dominated by just a few, older, would-be ‘gods’. Much modern literature of, and relevant to, climate science is published in paper literature dominated by a cabal of like-minded scientists who constitute a (‘MMM’) i.e. mutual mental masturbation club who fiercely (and childishly) exercise their dominanve of the peer review process. BTW, may I emphasize this is not new in science – it is a well known ‘dark side’ of science which has long applied. Boy will be boys and many bright scientists are little more than boys inside and outside of their science anyway. Aspergers is often like that. So, the real tipping point is already past us. A couple in Laval, Que. has sparked a fierce debate over how far schools should go to teach children about environmental responsibility after their six-year-old son was shut out of a kindergarten draw to win a stuffed animal because he had an environmentally unfriendly sandwich bag in his lunchbox. John Brookes – thanks for answering my question on what ‘act now’ means. Now tell me how a ‘carbon price’ is going to fix things? I assume you’ll answer me with a statement that it will increase the price of high-carbon-dioxide energy generation and subsidise that of low-carbon energy generation. Yes, very clever. Now kindly point out to me a scheme, anywhere in the world, where pricing has actually reduced total c02 emissions. Any scheme, anywhere. Oh, plenty have raised taxes and redistributed income, but the co2 output just keeps climbing and climbing. Because a coal plant closed in Europe is usually offset by something else opening in India or China. It doesn’t work. Why? Because there is only one alternative to wide scale co2-free energy : nuclear energy. And there just isn’t enough nuclear engineers or companies in the world with experience to build enough nuclear plants to replace the existing coal fired plants and to keep up with energy growth. Even as it is, there’s so many plants on the drawing board now that costs are skyrocketing. And even if you could find the people and resources to get one built, the same parties proposing a ‘carbon price’ won’t let you build either nuclear plants or build dams for hydroelectric schemes. So it’s a case of ‘wind or solar’ – one which doesn’t work at night and the other which doesn’t work unless the wind is the right strength and direction and requires a welcoming populace to build massive windfarms. Cigarettes have a very high ‘carbon price’. And I still see plenty of people walking around with one stuck in their mouth. You don’t even have to subsidise the alternative (not smoking) because it is free. Even if you paid people not to smoke (now, there’s a public policy gem!) people would still smoke. Same goes for energy usage. Energy usage is a perfectly inelastic demand curve. How many people really switch off their lights when they are a bit short of cash? I’ll tell you : nobody. Why do you think the power companies cut people off? Because they keep using electricity even when they can’t afford it anymore. Don’t you understand that? Energy is essential – you can’t just decide to ‘use less’! If you increase the price of energy, people will reduce their usage up to the point they can, which is not very much. Because after they’ve turned the TV off stand by and thrown the AC in the bin, there’s precious little more they can do except eat room temperature meals, have cold showers and read books by candlelight. And then you’ve got transportation fuels. There is no viable alternative to avgas and bulk container fuel for shipping. Unless you start authorising private nuclear powered shipping. Can you see that one happening? No, I didn’t think so. Don’t come back with some PR BS about Airlines trialling bio fuels on planes. There just isn’t enough scale to farm enough feedstock for biofuels. Even if you converted the entire private motor car fleet in the world (impossible in the timescale) to electric, you’d need more of those pesky nuclear plants, which take a long time to build, and aren’t allowed anyway. Then you’ve got the long distance freight trains, the truck fleet. And then you’ve got to convert all those fossil-fuel heated houses to use electric heating instead. Even if your carbon trading scheme is successful (which it wont’ be, witness the closure of the Chicago exchange and the halting of trading of the European exchange through fraud) and you drive up the price of carbon-related fuels, you physically cannot build the alternative infrastructure on a timescale that is required to stop and then reverse the co2 emissions. As I said before, the horse has bolted, there’s no stopping whatever effects of co2 concentrations are going to be. Your only choice for ‘action’ is to completely destroy the way of life we all enjoy. To put people under an oppressive regime that outlaws things like private motor vehicles and high enery usage. A world-wide North Korea, if you like – they’ve got a pretty low co2 emissions per capita value, and so does Myanmar. So John – be honest now – do you really believe that we could ‘act now’ and really, truly stop and reverse co2 emissions, even if somehow every single government in the world decided to get on board? If you are honest you’ll admit it’s a pipe dream – a pie in the sky ideallist vision of a world that cannot and will not exist. You can still want it – nothing wrong with hopes and dreams – but you’re much better off being honest with yourself and admitting it’s a hat full of wishes and nothing more. As for your ‘tipping point’ – the tipping point has been and gone. The world is no longer scared of climate change. In most western democracies, the ‘believe in catastrophic climate change’ percent is slipping down below 50%. In the developing world, most people see it as some type of tool of the west to further make their lives miserable. On that point, I find myself agreeing with them. You might share a joke with your circle of friends about the ignorant skeptics, but I cannot name a single friend of mine that even remotely believes the CAGW theories. Of the people I have met that do propose a belief, they’re not prepared to defend it – just saying ‘oh well, I read it in the paper’. Within a couple of years you’ll have conservative governments all over the world walking away from this racket, and stating they were mislead and it’s time to re-examine the science. The next IPCC conference will be even more of a shambles than Cancun. Neither Julia Gillard or Barack Obama can even bring themselves to mention it in speeches, and I can guarantee the only climate-related item on the next Federal election in Australia is Gillard being taken to the cleaners for lying to the Australian public and slugging them with taxes they don’t want or need. The heady days of Nobel prizes, Oscar winning mockumentarys and Copenhagen-style summits are in the past. The tipping point was December last year, and it’s receding into history. You’re going to struggle to find people to have chats with about this stuff. Seem too one dimensional to explain complex phenomena. It calls up imagery of a see saw balance of weight, when what we are really talking about are multi-dimensional phase shifts within complex systems far from equilibrium. 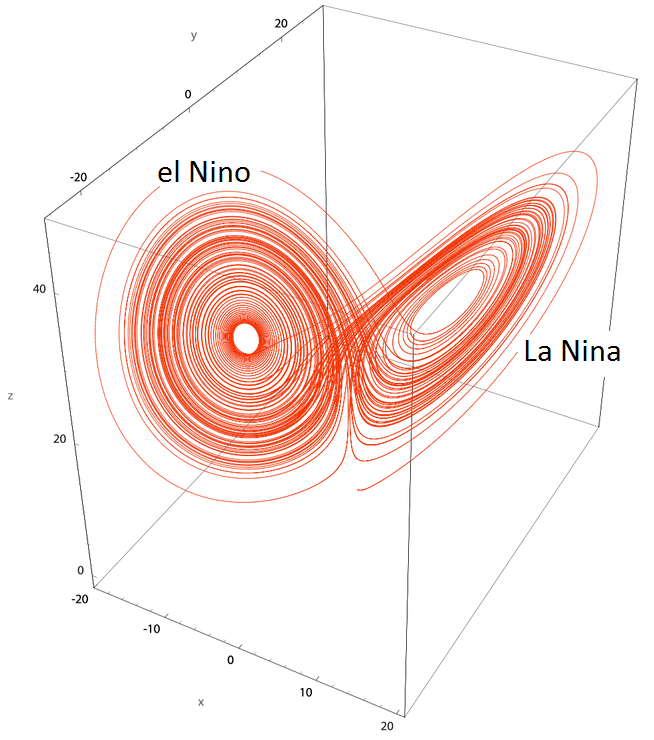 For instance the El Nino/La Nina is an example of complex nonlinear oscillation between two stable states around the same strange attractor. Uh, actually, that looks like there could be a tipping point in there somewhere, doesn’t it? The same sort of phase shifting happens when novel communication technologies arrive. For instance, the whole skeptical inquiry into climate orthodoxy could have never come to be within the framework of pre-Internet information distribution networks. Skepticism would have been adequately suppressed by the ABC before about 2001. But not now, not ever again. Orthodoxy without control of information distribution is impossible to maintain. Don’t hate the media, become the media! Fish do not need a leader or external stimuli for their school organization…the group movement of a school can be maintained by interactions in which each individual controls its movement in relation to its neighbours. Our three-dimensional simulations reproduce the typical characteristics of real schools, if the behaviour of the single fish is based on four patterns: attraction, repulsion, parallel orientation and averaging the influences of at least four neighbours. Heck, I don’t know where I am going with this comment except to say I love the scent of an emergent paradigm in the morning. Jo Nova, brc, Steve, Derek, Jeff the Rocket Scientist, Cohenite, George, Vince and even poor lil’ Johnnie, I sense that you can smell it too. We’re all waking up at the same time and on so many levels in so many different intersecting spheres of influence. Now Wes, further @ 103 you have gone too far! FISH? I have always preferred the flock of SHEEP analogy! Sheep are cute and fluffy and warm. Fish are cold and slimy and smelly………Wait a minute you may have a point………. Sorry Vince; All the evidence (I know you hate that) is pointing exactly the other way — see wes george @ 105 for an explanation of what’s happening. So you can’t rationally argue the science (never could — why AGW proponents usually dodge and always lose debates), and now you’re losing the political battle. Time to pack it in. Jo, how was outgoing longwave radiation measured in ~1948, the beginning of the graph, and how good are those measurements? Has such measurement gotten better? According to Dr David Viner, a senior research scientist at the climatic research unit (CRU) of the University of East Anglia,within a few years winter snowfall [in the UK] will become “a very rare and exciting event”. Which leads me to ask: Just how many falsified predictions does it take for “you guys” to start wondering if the AGW hypothesis is bunk? Gary Thompson @100 – I read your American Thinker article and thought it was fascinating – posted it on a discussion going on on FB re climate and was promptly sent to a strong critique of what you wrote by the chap who runs skepticalscience – See here: http://www.skepticalscience.com/news.php?n=144 Have you answered his critiques in any way since he made them? Would be very interested to hear. Thanks! This says everything about climate models that most people need to know. The last paragraph summarises perfectly. And if Steve Short is still reading I am sure he would point you in the right direction about Harries. To all those good people with an inquiring mind. The so called science of climatology is not science until they unravel the most vexatious questions with real provable answers. Our world has seen cyclic changes from ice age to interglacial periods, big changes with fairly precise time lines, this implies very specific causes,find them and prove them. Both ice ages and interglacials, have some rather profound temperature swings, big changes with a real cause, find them and prove them. If and when our erstwhile climatologists [soothsayers] can show just cause for these events, then and only then can they be called scientists. Thus from that time on can we start to believe their prognostications. Something very strange is going on here. Van Andel only takes into account the negative feedback of clouds (if there are less clouds, more heat can be radiated from the earth into space), but he doesn’t take into account the positive feedback (if there are less clouds, more heat from the sun is able to reach the earth). Therefore his conclusions about the behavior of clouds as a netto negative feedback are … rash, to say the least. Van Andel believes that the earth is warming, but that the warming will remain limited due to the negative feedbacks built into the earth’s system. The most important negative feedback Van Andel mentions is cooling through increased convection. In layman’s terms this is translated as: more frequent and more extreme tropical storms (This was also mentioned by Van Andel in his article titled “CO2 and climate change”. Strangely enough, it isn’t mentioned in the slideset). So his message is we have to set our hopes on more storms to cool down the climate ? Garnaut is a despicable grub. He is as bad as the criminal looters after a disaster! You are absolutely correct Brigitte. Like Miskolczi (who he seems to endorse) Van Andel’s presentation has some suspect, and excessively simplistic, thinking. There is no doubt that the treatment of clouds, as well as the gross (negative feedback) effect of clouds on Bond Albedo needs to take into account the (lesser) positive feedbacks of wet clouds i.e. largely due to re-radiation of a portion of the released latent heat back towards BOA during precipitation. IMO this is about 62.5% of all cloud based latent heat (downwards) – or at least a 62.%: 37.5% split seems, on average, to be consistent with all modern attempts at global heat ‘balances’ from the body of available data (noting that at any one time the Earth is regionally actually on one side or another of full equilibrium – that is why we have cyclones and blizzards etc). Note this does not include the radiative distribution (up and down) of sensible heat (dry thermals) realised in the atmosphere – also re-distributed up and down roughly 62.5% : 37.5%. It’s all about the gross geometry of the situation…. I’d be happy to email you a speadsheet which attempts to lay this out in a reasonably straightforward fashion. And so I’m still a sceptic (who agrees with Spencer and Lindzen that on balance the effect of clouds is a net negative feedback)! Clouds have the unusual property of being the control variable in the feedback system. This is not the hypothetical IPCC feedback loop controlling surface temperature, but the physical feedback system controlling the Earth’s energy balance. In that respect, the gain would be the amount of power that leaves the surface presented to space, relative to the amount of power that enters the planet. Without clouds, the surface would be the planets surface whose temperature, as seen from space would be 287K minus absorption. With clouds, cloud tops obscure the surface instead and the equivalent temperature is about 272K, also minus absorption. Relative to the 278K of equivalent incident solar power (341.5 W/m^2), without clouds the gain would be 287K^4 / 278K^4 (1.14) which is more than the gain with clouds of 272K^4 / 278K^4 (0.915), therefore, clouds are supplying negative feedback, reducing the gain. The surface happens to be warmer because of GHG and cloud absorption and re-emission, so the feedback system adds enough clouds to reduce the gain enough such that the energy arriving is equal to the energy leaving. Here is a great satellite image of the CURRENT Northern Hemisphere’s ice age. I agree completely, this is just another way of stating what I crammed into my little Excel spreadsheet model. you still don’t quite provide a thermodynamically coherent explanation as to why there should be ‘(just enough clouds’. Why just enough? By whom, by what, or how is this ‘just enough’ ‘decided’ or affected? The answer to that question is that the balance of too many or too few clouds is established as a CONSEQUENCE of lateral and meridional circulation i.e. winds. Winds form, either rain out or blow/evaporate away. Weather systems form, decay or move elsewhere. These effects occur because, given a constant solar heat intput (on average) the whole system is also trying to maximize it’s entropy. The fundamental driving force achieving this (cloud/non-cloud) balance is the MEP Principle – the tendency towards maximisation of entropy (disorder) over the whole planet. It’s ‘wall-to-wall butterflies’ all fluttering around dissipating the heat of their metabolisms….Beautiful! this is fuzzy logic. You still don’t quite provide a thermodynamically coherent explanation as to why there should be ‘(just enough clouds’. Why just enough? By whom, by what, or how is this ‘just enough’ ‘decided’ or affected? The real answer to that question is that the balance of too many or too few clouds is established as a CONSEQUENCE of lateral and meridional circulation i.e. winds. The fundamental driving force achieving this (cloud/non-cloud) balance is the MEP Principle – the tendency towards maximisation of entropy (disorder) over the whole planet. When you have much of the planet covered by oceans, entropy production becomes a party! It’s sort of like…..’wall-to-wall butterflies’ all fluttering around madly dissipating the heat of their metabolisms and absorbed sunshine….Beauuuutiful! While water vapor increases with temperature, cloud coverage is decreasing because cloud coverage is ‘water limited’. If there are too many clouds, the surface cools owing to more reflected power than power absorbed by clouds and returned to the surface. If there are too few, the surface warms. The amount of clouds that there can be at any point on the planet is between 0% of 100%, inclusive. On average, the amount of clouds there will be is the amount required for the energy in to be equal to the energy out. Winds and weather are secondary to this basic constraint of Conservation of Energy which drives the planet into a thermodynamic steady state. Conservation of Energy is not required locally, it is not required regionally, and it is not required all over the planet at any instant in time. It is only required (radiatively) for the planet as a whole over the long term. If it doesn’t then the planet heats or cools. This is why the CAGW global heat ‘balances’ rerquire a msal negative value (more in less out). Thermodynamic equilibrium is not required locally, it is not required regionally, and it is not required all over the planet at any instant in time. It is only required for the planet as a whole over the long term. You significantly misunderstand the meaning of (a thermodynamic) steady state. Steady State is actually a long term mean of numerous Unsteady States either side of the mean. Unsteady states have significant persistance in time (at any scale). If they didn’t the system would be uniformly smooth. There is an enormous literature on non-equilibrium thermodynamics – including at large, planetery scales. Please take my word for it, as a thermodynamicist of 35 years. Aged 62 I actually make a living from it! And why not Ed=Aa as well? Yes, COE is not required locally, but is is required globally. That’s my point. It’s the global constraint that drives the system towards equilibrium, settling in a steady state oscillating around the mean, The fact that COE isn’t required locally is why clouds can vary between 0% and 100%. You see, clouds can be anything, but the long term steady state behavior requires COE to be satisfied, hence average clouds are what they meed to be for this constraint to be met. You can also be sure that I fully understand the concept of a steady state response. In this case, the average steady state is easily computable as the solution to the relatively simple DE, Pi = Po + dE/dt, where Pi is the power from the Sun, Po is the power leaving the planet and the difference, dE/dt, heats or cools the planets thermal mass, where E is the energy stored in that mass. I am NOT having a go at anyone in particular, but at the idea in the first place. Not on any timescale I am aware of. If the system has more ins and outs than allowed for then any “COE” “balance” or “radiative equilibrium” is a false illusion. New gases and solids added to the system from within (earth’s core fissile waste products). that which is constantly being stripped off and lost from the system to space. Whilst we have a “residue” between the ins and the outs we will have oceans and an atmosphere, and a climate. the present illusions of “COE” and “radiative equilibrium” are just that, illusions. They are politically convenient and abused illusions of a pseudo science – AGW. When we talk of this not necessarily being true locally, it’s because there are fluxes to and from neighbors, but after accounting for these fluxes, COE is again satisfied. The “unbuild it again,” final line says it all. One of the great problems with the climate debate is precisely arguments from authority. So while you are without doubt an authority on the topic, please don’t ask us to trust your authority. Instead, of appealing to our faith in your expertise, construct a sound argument from the vast expertise which you have at your fingertips. I only ask this of you to maintain a kind of skeptical ideological purity. For how can we point an accusing finger at those who would argue “consensus” and demand we accept expert opinion instead of the releasing of hidden methods and data sets when we ourselves produce “trust me” lines as a shorthand for evidence not presented? Yeah, I am nitpicky about this. btw, thanks for the pointer to Kleidon and Lorenz, 2005. Post 129 in reply to post 128. This is exactly my point phrased differently, AND dismissing my main point. My point is (for clarity), if you do not have all the ins and outs, any illusion of COE is exactly that, an illusion. but they are missing, so the present illusion is an illusion. when it is nothing of the kind..
Again I am not having a go at the individual here, but the idea as described. this is patently into the realms of pseudo science. The why is very simple, its called COE. The how is even simpler where if the planet is emitting more power than it’s receiving, the planet cools until it emits less. If it’s emitting less power than it’s receiving, the planet warms until it emits more. Don’t be concerned about the pittance of power originating from the Earth that’s usually ignored or other second and third order effects. None of this changes the basic requirement of physics that energy must be conserved. You also seem to think that COE somehow supports CAGW, when in fact, COE is one of the main arguments which disputes it, which among other things precludes runaway effects. I agree that we don’t know enough of the parameters to a high enough precision to calculate something like the watt or so of ‘annual deficit’ that people like Trenberth think they can calculate, simply because small numbers like this are buried in the noise and overwhelmed by natural variability, nonetheless, this doesn’t mean that the physics itself is wrong. COE is one thing, assuming a balance at a planetary scale for only one in and one out is another. Given we have all the ins and outs yes, if not, then no, AND assuming (and dismissing some as unknown but assumed as constant, and “insignificant”) you have all the ins and outs will only mislead you to thinking yes..
A supposed “radiative equilibrium”, that we have upset is the very heart of AGW. Arguing for COE in the way you suggest is supporting AGW “theory”. You are also assuming a closed system, when it is an open system, my main point really when you think it through. Wow that hockey stick looks really far off! Bigger clue. Magnetic field, proton flow, ozone hole size. Yes. The Sun has primary control over Earth’s climate. d.) The Sun’s dominant control of Earth’s climate. A participant in the NR (neutron repulsion*) discussion group expressed concern that “Muslim fanatics” might use NR as a weapon while government agencies ignored overwhelming evidence that NR is the most powerful known source of nuclear energy. Jo, here is a prediction. If Sue Solomon is principled she will destroy the green dream. If she isn’t she will have as her epitaph “nobody”. Difficult. Dr M, you need a f***** hard kick in the balls. You are f****** very late. Dr M. Lighten up. My anger is not specific. You had to grow, I understand. Now turn your brain on. Turn the political part (the real science part) off and give me some reasonable answers. Pretend I’m a not politician. Give me some weights. Gosh. Us stupid public can’t see what exactly? My Q is this. Why has science turned against us? Was it so cheaply bought? With our money? Can you not express yourself adequately without profanity? Suggestion: Find that dusty dictionary on the (dustier?) bookshelf and use it. So who’s trying to “buy” the science, Oliver? What is the [snip] motivation and why are they pushing blatantly incorrect information with so much gusto?